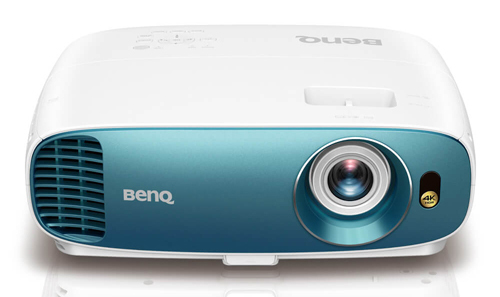 The BenQ TK800 is a brighter version of the BenQ HT2550 one of several new 4K projectors to hit the market in the last few months that is built around the latest 0.47" UHD DLP chipset and selling for $1499. Like the HT2550, the TK800 is 3D capable in native 1080p mode, which is one of the primary distinguishing factors between these two models and several other 4K projectors under $2000. For those who have a collection of 3D discs in 1080p HD resolution, this is a welcome feature. The TK800 weighs 9.3 lbs, so it is portable enough for backyard movie night or other transportable uses. It has a much better than average onboard speaker with dynamic range that is surprising for its size--again a nice feature for occasional backyard use. And it has keystone adjustment, a feature that is missing on several of its competitors. At the current price of $1499 the BenQ TK800 competes most directly with the ViewSonic PX747-4K at $1299, which is ViewSonic's brighter version of the ViewSonic PX727-4K, also at $1299. The essential change in both the BenQ TK800 and the ViewSonic PX747-4K is the switch to a color wheel that has a white (clear) segment to boost white light output. Brightness. 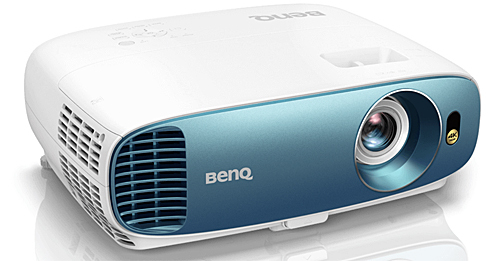 The BenQ TK800 is rated at 3000 lumens compared to the 2200 lumens of the HT2550. As is typical, this projector has an exceptionally bright factory calibration, called "Bright," which is greenish in tint and for the most part not recommended for video presentation unless you don't mind a green picture. It also has presets labelled Vivid TV, Cinema, Sport, and two custom adjustable User modes. Like the HT2550 it has a Brilliant Color function that can be turned On or Off (no incremental scale of 1 to 10 as on many DLP projectors). Turning it off reduces lumen output by about 55%. There is also an Economic lamp mode which reduces lumen output by 36%. Zoom lens light loss. The TK800 has a 1.2x zoom lens that we measured a losing about 3% at the telephoto end, so there is no reason to worry about which end of the zoom you're using. Brightness Uniformity. Our TK800 sample measured a very good 82% uniformity, better than what we saw with either of our two HT2550 test units. Since this is essentially the same light engine with a different color wheel, we suspect the difference may be due to manufacturing variance. In any event, none of the three samples had any observable uniformity issues while viewing program material. Color Brightness. The white (clear) segment in the color wheel produces a lot of white light compared to color light when the Brilliant Color option is set to "ON." When Brilliant color is Off, color brightness equals 100% of white brightness, as one would expect. However, the effect is not attractive. Turning Brilliant Color off drops lumen output by 55% (Cinema mode drops from 1792 lumens to about 800 lumens). But it also reduces contrast and shifts color balance toward green, so it is not likely to be a preferred choice for users, who in the end will be buying this model specifically for its increased lumen output. With Brilliant Color on, the extra white light improves contrast, neutralizes the greenish tint in the color calibration and shifts the image toward a more neutral but still cool, bluish cast. With Brilliant Color on, color brightness is only 46% of white, so there is some loss of color saturation. Practically speaking, the most obvious effect of this is that white objects in the picture pop a lot brighter than surrounding color objects. This gives a higher contrast picture which is quite a bit more appealing, but the picture is not in its intended balance. 3D Performance. As of early October 2018, the TK800 was one of just a few sub-$2,000, 4K-compliant projectors to offer 3D, a feature that makes it of special interest to those who have a collection of 1080p 3D discs. The other 4K projectors in this group are the BenQ HT2550 ($1,499), the Optoma UHD51A ($1,699), and the Optoma UHD51ALV ($1,799). Additionally the Epson Home Cinema 4000 ($1,749), and the recently announced Epson Home Cinema 4010 4K PRO-UHD Projector ($2,000)are "4K enhanced" models that accept UHD signals and perform pixel-shifting with 1080p 3LCD panels. HDMI Bandwidth. This projector has two HDMI ports. The first is HDMI 2.0 / HDCP 2.2 compliant with a bandwidth of 18 Gbps. The second is a standard HDMI port with bandwidth of 10.2 Gbps. Input Lag: Input lag at 44 ms on the TK800 is slightly faster than the 50 ms on the HT2550. This is fine for most casual gaming, but serious or professional gamers may want a faster unit since many 1080p projectors can get down to 16 ms. However, they are not 4K projectors - 44 ms is about as fast as we've seen on 4K models; only the PX747-4K beats the TK800, but only by one at 43 ms.
Rainbow artifacts. Rainbows are very low on most DLP home theater projectors these days, including the TK800. However some people are uniquely sensitive to this artifact, and there is no way to predict whether you may be one of them. If you are uncertain, buy from a reseller with a friendly return policy so you can test it out yourself. Fan noise. BenQ has done a good job with fan noise on this projector. The noise is audible in full lamp mode, but not at all excessive or objectionable in our opinion. Dropping the unit into Economic mode will render the fan very quiet with just a low buzz that you can detect in a silent room. Even in High Altitude mode, which is required at 1500 meters elevation, fan noise is remarkably unobtrusive compared to a lot of projectors we've heard. And in High Altitude, dropping it into Economic mode renders it surprisingly quiet. On-board Audio. The TK800 has a single 5W speaker mounted on the side. However, the audio is quite good compared to most other portable projectors. The audio is louder and has better dynamic range than the 10W speaker on the PX747-4K, so specs are not relevant for comparative purposes on this feature. This on-board audio capability, while it is no substitute for a good surround system or even a sound bar, is particularly handy for backyard movies or other portable applications where you might want sound on board. Lamp Life and Replacement Cost. BenQ is quoting 4000 hours of lamp life in Full lamp mode, and 15000 hours in SmartEco mode. A replacement lamp is $149. Warranty. The BenQ TK800 comes standard with a 3-year warranty. The TK800 has a fixed projection angle that throws an image such that the bottom edge of the projected image is a few inches (or about 10% of the image height) above the centerline of the lens. There is no lens shift, so take care to install the projector as precisely as possible relative to the screen. 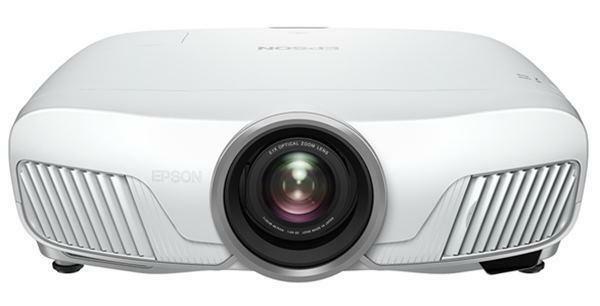 This projector has a 1.2x zoom lens that will throw a 120" 16:9 image from a distance of about 12'10" to 15'3". If you have your seats about 1.25x the screen width (a comfortable viewing distance for many people), they would be positioned about 11 feet from the screen. So the projector would be positioned just behind the seating area. To check the throw distance required for your desired screen size, see the BenQ TK800 Projection Calculator. Due to the fixed offset that positions the image entirely above the centerline of the lens (or below it if ceiling mounted), the ideal installation in many cases will be a ceiling mount. It is also possible to place the projector on a rear shelf or stand behind the seats and project over the heads of the viewers. However in most cases this will require a downward tilt of the projector in order to hit the screen. If you do this, you can use keystone adjustments to square up the resulting trapezoid. Keystone control is driven from the remote. To activate Keystone adjustments, close the menu and use the up and down arrows on the remote's navigation pad. As an aside, we generally caution against aggressive use of keystone adjustments on any projector due to the fact that it operates by deactivating a portion of the display. Doing this reduces lumen output and pixel resolution. So keep keystone adjustments to a minimum whenever possible. Dark frame around image. This projector creates a very dark but not perfectly black frame around the projected image. The frame is about 4.5% of the picture width. So for a 120" diagonal image (105" in width), the projected dark frame is almost 5" wide around the entire active area of the 16:9 image. Two notes on this: First, this artifact exists on all of the projectors that have the 0.47" UHD DLP chip, so it is not unique to the TK800. Second, the projected image of the TK800 itself is bright enough and high contrast enough that the dark frame is difficult to notice in most circumstances. Though some users have reacted as if this is a constitutional issue, we suspect in practice that most users won't notice it or be bothered by it, at least on this projector. 3D Manual Settings. The BenQ TK800 has 3D for 1080p sources only (not 4K). The projector will not automatically recognize a 3D source signal. You must go into the menu and turn 3D on in order for it to play properly. Once 3D is turned on, any subsequent 4K material being displayed will be projected in native 1080p until you go back into the menu to turn 3D off. As noted above, the most direct competitor to the BenQ TK800 at $1499 is the ViewSonic PX747-4K at $1299; both are brighter versions of the HT2550 and PX727-4K respectively, with the primary difference in both being the substitution of an RGBRGB color wheel with an RGBW color wheel. The white segment boosts maximum light output on the TK800 and PX747-4K at the potential sacrifice of color saturation. 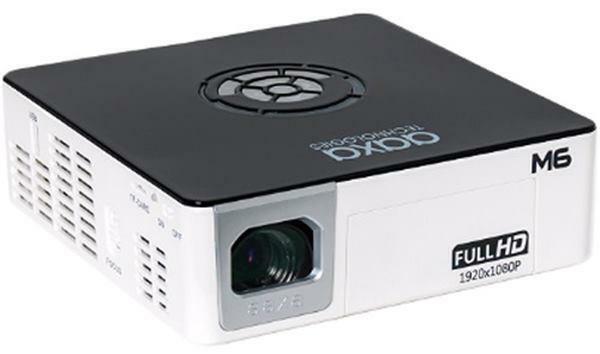 These two projectors are almost identical in many respects -- physical size, 4K resolution with 0.47" chips, 1.2x zoom and throw distances, vertical offset, lumen output, connections, etc. Input lag measured 43 ms on the PX747 and 44 ms on the TK800. Brightness uniformity measured 78% on the PX747 and 82% on the TK800. Color brightness in Movie/Cinema modes measured 46% on the TK800 and 57% on the PX747-4K. However, though they share all of these similarities, the pictures look a lot different when you fire them up due to the design engineers' radically different approach to calibration and programming, and (apparently) somewhat different versions of the RGBW color wheels. The video optimized presets are called "Cinema" on the TK800 and "Movie" on the PX747-4K. In these modes (with factory defaults) the PX747-4K delivers the more satisfying picture out of the box--it is higher in contrast and color saturation, has greater image depth (three dimensionality), and it has a warmer and closer to neutral color balance that makes flesh tones in particular look more natural. The TK800 has a preset called Vivid TV that does not have a similar counterpart on the PX747-4K. When putting it into Vivid TV mode, the whites pop substantially with a cold, brilliant white and contrast is improved. Color saturation is also substantially enhanced to the point of being somewhat overdriven. Color balance shifts from cool, slightly blue to more of a greenish hue and some detail in the highlights and shadows is lost. However, the overall subjective effect of the Vivid TV mode is that the picture is more dramatic, richer, and higher in contrast than Cinema mode. Though Vivid TV produces somewhat of an artificially overprocessed character that videophiles would find objectionable, many casual users will be attracted to the Vivid TV mode because it is rich, colorful, and dynamic. Many would find it a good option for viewing in ambient light. Both of these projectors have an array of picture controls that will allow you to alter color balance, saturation, black levels, sharpness/resolution, and so forth. The TK800 can be professionally calibrated to achieve the warmer and more neutral picture of the PX747-4K, although the PX747 retains a small but noticeable advantage in contrast and saturation in their Cinema/Movie modes. The bottom line in sorting these two projectors out is this: If you want 3D and/or you'd prefer to have the Vivid TV mode for ambient light viewing, the TK800 is the better choice. If you want better color out of the box without having to mess with calibration, and you are willing to give up 3D for an incrementally higher contrast/ higher saturation picture, the PX747-4K is the better option, and you save $200 to boot. Our original conclusion for the BenQ TK800 observed that it performed noticeably better than did our early production sample of the BenQ HT2550. Since then we've tested a later sample of the HT2550 with both upgraded firmware and an upgraded lens that's now found on both models. Comparing the TK800 with the second HT2550 test sample, each does better than the other on some performance issues, and they tie on others. Both focus sharply from edge to edge across the screen, for example. The TK800's, measured brightness uniformity is better compared with either of the HT2550 test units, perhaps due to manufacturing variance, though as noted earlier, these differences were meaningless in daily viewing. Color balance in factory default calibrations is also similar between the two. Compared with a reference image, both deliver a reasonably close match, but they differ slightly in different ways, so each is more similar to the reference image than they are to each other. With Brilliant Color on, the TK800 has the better color balance. With Brilliant Color off, the HT2550 gives a very close match to the reference image, and better color balance than the TK800. One last plus for the TK800 is that it is a brighter projector, and its increased brightness does not overly compromise color saturation to any significant degree. Based on the second HT2550 test unit, we are equally enthused with both units. We'd put the TK800 higher on our short list for a room with ambient light, and give the HT2550 the higher spot for a dark room. From a value perspective, the BenQ TK800 combines 4K resolution with a bright picture, very good uniformity, 3D capability, and a three year warranty for $1499. Vivid TV mode in particular gives it extra vibrancy for ambient light viewing. If that combination of features for that price hits your hot button, we believe you'll have a lot of fun with the TK800.